The GS-0035 tool is the reproduction of a tool contained in all original armorer tool kits. It is designed to be inserted into the rear sight block for driving out a damaged latch and installing a new unit. Just like the original it has a tab on each end to engage the shallow notch of the rear sight block. 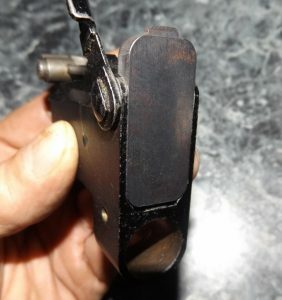 This tool supports the thin sides of the rear sight block and prevents collapse when the latch is either driven out or headed after installation. It is manufactured from hardened tool steel for a lifetime of use. 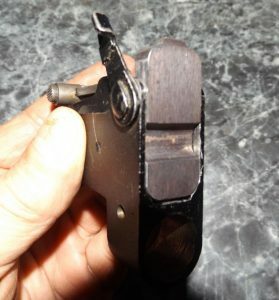 To remove a latch, the GS-0035 is inserted so its tab engages the notch of the rear sight block and its groove surrounds the latch. The appropriate drift is then used to drive out the damaged unit. 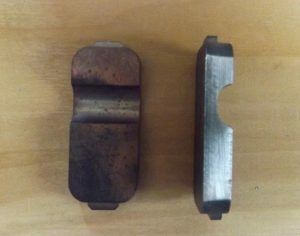 For the installation of a new unit the tool is flipped and the new latch turned until its “flat” side is facing the flat side of the tool. The protruding end of the latch is now headed. Tool is position for removal of latch. Tool groove clears latch so lever position is not important. Tool is position for heading of latch. Latch is turned until its flat area agrees with face of tool.